Age range 0-7 (or all ages! 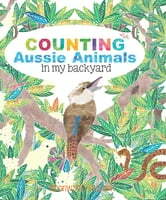 )Bronwyn Houston makes counting to 10 so much fun! Her textured and vivid illustrations bring a tropical Australian garden to life, with a touch of humour thrown in. From kookaburras laughing on a fence to bull ants marching through the dirt … find out what these Australian animals get up to in Bronwyn’s backyard.